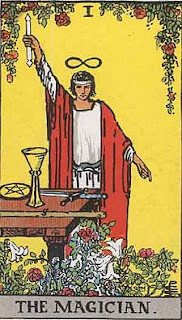 The 1st card of the Major Arcana is The Magician, who symbolizes intellect, communication, information, as well as magic. Over his head is an infinity symbol, which in some Tarot decks takes the form of a hat, in others a halo. Many interpretations may be drawn, one of which is that The Magician recognizes the cyclical and unending nature of life and is empowered by this understanding. The positive traits suggested by this first card include diplomatic skill and shrewdness but, negatively, lack of scruples and opportunism. 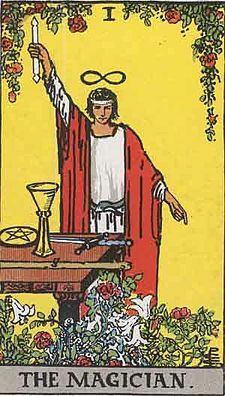 Perhaps the Magician symbolizes the dilemma facing many January 1 people-- a desire for success and greater utilization of their talents can demand a corresponding "flexibility" in their moral code. January 1st is the celebration of Kalends. New Year's Day and the festival of the two-faced Roman Janus, god of gates, doorways, journeys, and new beginnings. This day is sacred to the Greek gods Zeus and Hera and to the Roman Jupiter and Juno; it is a day of offerings to the Roman Fortuna, goddess of fortune and fertility, and is sacred to the red-haired Irish goddess of war, The Morrigan. 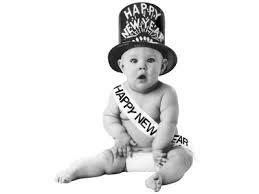 The first New Year's day was celebrated in 45 B.C. with the adoption of the Julian calendar. 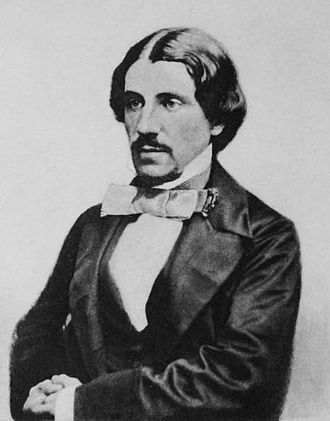 Tired of having to sync the lunar calendar each year with different days to coincide with the astronomical seasons marked by equinoxes and solstices, an Alexandrian astronomer named Sosigenes created a more regulated civil calendar, a solar calendar based entirely on Earth's revolutions around the Sun, also called a tropical year. It takes our planet on average, approximately 365 days, 5 hours, 48 minutes and 45 seconds (365.242189 days) to complete one full orbit around the Sun. And you thought it had something to do with the death of Jesus, some would have you believe that. To Carlyle's at three. He gives me a book. We walk out. "This morning," he said, "after midnight, as Mary and i were sitting together, we heard a chorus of male voices outside the window singing Auld Lang Syne this morning. We peeped out, and saw five or six figures on the other side of the street. I was really touched. I put up the window and said 'Good-night!' One of them eagerly replied 'Good-night!" and then they all vanished silently away.' Then with a laugh he added, 'Truly the songs of Judah in a Babylonish land!'... He spoke of 'Hogmanay' in the streets of Edinburgh, hot punch and kissing. There used to be gangs of footpads in Edinburgh. Carlyle was once struck on the head by them and had his hat broken. He saw three men of this kind hanged." Finally, don't forget to look up at the sky for the first of two January 2018 full moons falls on the evening of January 1, 2018, for most of the Western Hemisphere (January 2 for the Eastern Hemisphere). This full moon comes only 4.5 hours after the moon reaches lunar perigee – the moon’s closest point to Earth in its monthly orbit. Thus this full moon presents the closest – and thereby the largest and brightest – supermoon of 2018. And if you miss this one, the next is January 31, 2018 making it a Blue Moon month. We'll look at the signicance of this on the 31st, should definity be an emotional month for those of us with feelings.